In the mid 1970s, forest departments in South-east Asia became aware of the vulnerability of rattan supply and began investigations aimed at safeguarding the long term supply of canes for the industry. Regarding that almost all the rattan that enters world trade has been collected from the wild from tropical rain forests. With forest destruction and conversion, the habitat of rattans has decreased rapidly in extent over the last few decades and there is now a very real shortage of supply. Cultivation of canes presents the best possibility for the future. Early research examined pre-existing cultivation. In one small area of Indonesian Borneo rattan has been cultivated in permanent rattan gardens on land adjacent to rivers that flood severely and for prolonged periods. This land, that is more or less unsuitable for any other permanent form of agriculture because of the flooding and very acid soils, appears to be ideal for the cultivation of one rattan, Calamus trachycoleus. The local inhabitants are try to develop a new method of cultivation that has been used as a model for rattan cultivation elsewhere, whether on flooded or dry land. However, this species has a cane of small diameter (6-12 mm); large diameter canes (in excess of 18 mm) are needed to produce the framework of cane chairs, and a major focus of rattan research has been to find large diameter canes that are suitable for domestication and cultivation in a variety of habitats. One of the highest populations of orang-utan in Borneo is in a rattan estate and over half the wild species of rattans recorded for Sarawak have been recorded as occurring wild within the boundaries of another rattan estate. In order to grow properly, rattan has to be planted under some sort of tree cover. There is some condition of forest that suitable to the growth of rattan, such as logged-over forest, secondary forest, fruit orchards, tree plantations or, even, rubber estates. Thus rattan planting preserves tree cover, and along with tree cover, where it is semi-natural forest, wildlife is also maintained. Such commercial planting thus offers attractive prospects for wise land use in the humid tropics, allowing a crop to be grown with minimal disturbance of the vegetation. 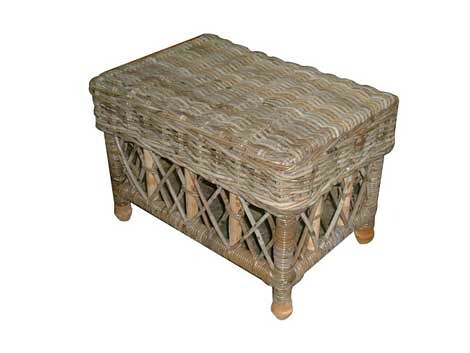 However, perhaps the most exciting potential of rattan is as a small-holder crop. Some rattans lend themselves to cultivation on a small scale under fruit trees or in rubber gardens. Such cultivation allows the small holder to gain extra cash returns from a small area of land.